Breadfruit grows naturally throughout the tropics. It is so nutritious that one could live off it! It’s name comes from its aroma which matches freshly baked bread. Since the mid-18th century, breadfruit has been planted throughout the world for an inexpensive and nutritious food source particularly in famine-stricken areas. Related to the mulberry, breadfruit grows on tall flowering trees that look like tropical palms. The fruit is large and shaped like a football, with a smooth spiked green outer skin. The high content of fiber in breadfruit not only helps reduce blood pressure and maintain a healthy heart, but also assists in lowering bad (LDL) cholesterol and raising good (HDL) cholesterol. It’s believed that breadfruit may diminish the risk of colon cancer, and assist diabetics in controlling their sugar levels. Extensive research is underway to explore other nutritional benefits. Breadfruit has been used by indigenous peoples to prevent heart attacks and reduce blood pressure and asthma symptoms. The flowers of the breadfruit tree are toasted and rubbed on gums to treat tooth ache. Minerals in breadfruit include calcium, iron, potassium, copper, zinc, phosphorus, selenium, magnesium and manganese. 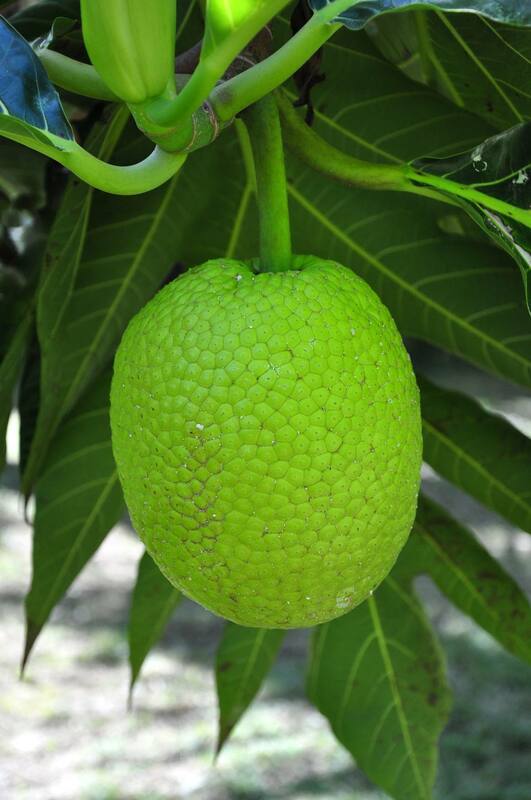 Breadfruit are rich in vitamins B, C, K and E, as well as protein. With no cholesterol and low in sodium and fat, breadfruit contain natural sugars and carbohydrates for a punch of energy. One cup of breadfruit contains approximately 227 calories, almost none of which are from fat. What fats there are come from healthy omega-3's. Breadfruit flour is gluten free and thus a favorite among those with gluten sensitivities. Breadfruit, although often cooked with spices and seasonings, can be eaten freshly sliced and as a juice or smoothie. Thank you Karina from Venezuela for posting this smoothie and juice recipes from Trinidad. Cut the breadfruit into quarters and remove the heart and seeds. Remove the skin. In Trinidad the breadfruit is boiled and the final drink served chilled or warm with rum. I've made this recipe substituting the alcohol and dairy for the alternatives listed above and it's delicious!